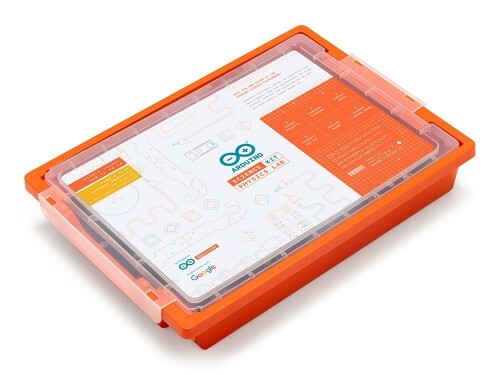 The first official Arduino kit designed for scientific exploration for middle school students aged 11 to 14. 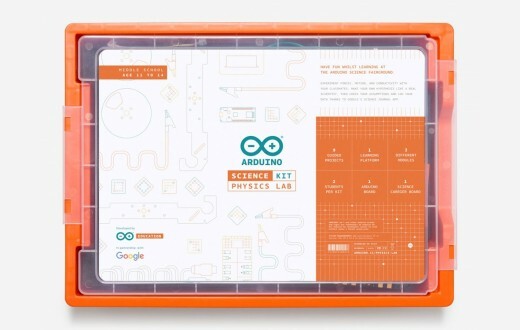 Developed in partnership with Google, the Arduino Science Kit Physics Lab is an Arduino-based physics lab, fully compatible with Google Science Journal available on Android (Not currently compatible with Google Science Journal App for iOS). Have Fun and Learn at the Arduino Science Fairground! Experiment with forces, motion, magnetism, and conductivity. Students will make their own hypothesis like real scientists, then check their assumptions, and log data thanks to Google’s Science Journal — a digital notebook for conducting and documenting science experiments in real-time using the smart capabilities of mobile devices. No coding experience required! Enjoy this new series of plug & play projects. ELECTRIC FORTUNE TELLER: Investigate conductivity of different materials. BUZZ WIRE: Steadiest hand wins! Build a conductive ‘maze’ and then try to avoid the buzzer as you guide the loop around your course. HAUNTED HOUSE THEREMIN: Did you hear that? Make paranormal noise with a magnet. THERMO MAGIC SHOW: It’s not magic, it’s science! Learn about how different materials conduct or insulate heat. The DROP ZONE: Can you slide faster than your friends? Explore gravity and measure the acceleration of your Arduino board. The GRAVITRON: Scream if you want to go faster! Learn about rotations per minute, circular motion, the force required to spin this ride, and the relationship to centrifugal forces. The PIRATE SHIP: Captain the ship and test the oscillation of a pendulum. The EJECTION SEAT: 3… 2… 1… Ignition! Make your board bounce to learn about harmonic motion. The CENTRIFUGE: Don’t get dizzy… Learn more about potential energy and motion. Let your students develop transferable skills such as critical thinking and problem solving through an inquiry-based learning approach. 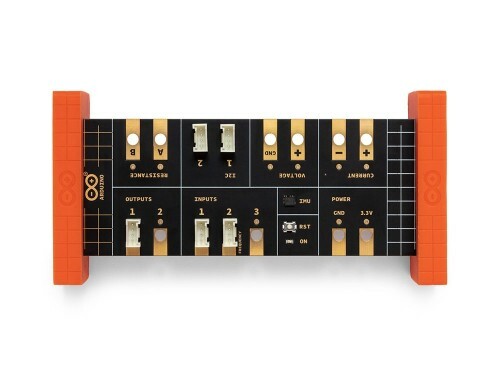 No prior electronics knowledge is required — students will simply need to connect their smartphone or tablet to the board, and use the onboard sensor and plug-and-play modules to simulate the rides’ dynamics. Data is transferred from the experiment to the mobile device via Bluetooth, where your students can analyse and record their results in the Google Science Journal App or worksheets if you’d prefer. 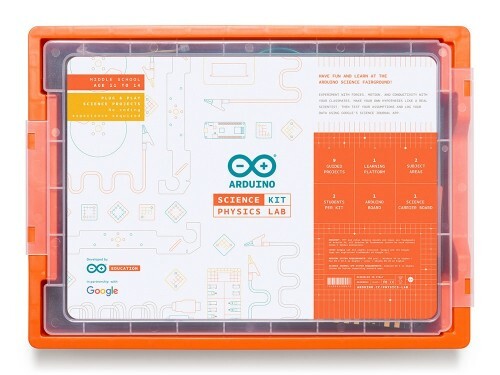 The Arduino Science Kit Physics Lab is compatible with Google Classroom too! You can now share the online activities directly into your Google Classroom’s space. 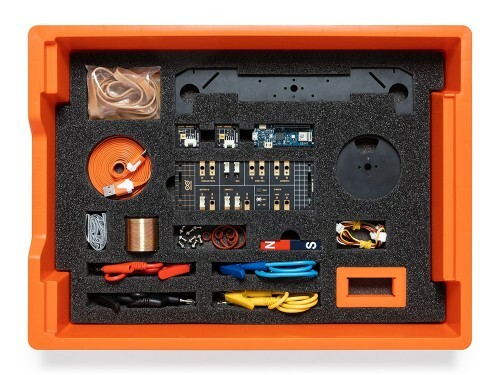 Everything comes in a handy storage box for future use, with all the necessary parts to assemble and conduct experiments. 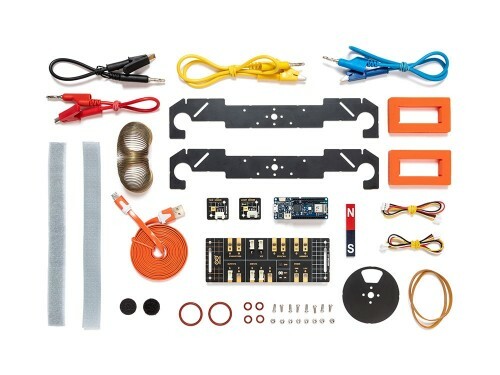 The kit features a range of sensors to measure light, temperature, motion, magnetic fields, and most importantly, full access to online course content for teachers and students alike. You’ll just need to provide a few essential classroom supplies (pencils, rulers, etc.) and a LiPo battery or a Power bank. If you own a Chromebook you’ll get a free month on Create for Chrome OS. precision, taking repeat readings when appropriate. Classification keys, tables, scatter graphs, bar and line graphs. such as displays and other presentations. Understand and use mechanical systems in their products . Understand how more advanced electrical and electronic systems can be powered andused in their products [for example, circuits with heat, light, sound and movement as inputs and outputs]. 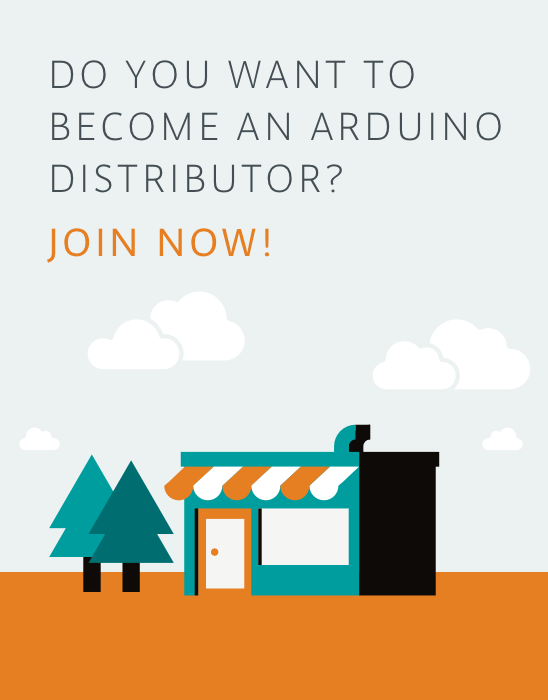 Apply computing and use electronics to embed intelligence in products that respond to inputs [for example, sensors], and control outputs [for example, actuators], using programmable components [for example, microcontrollers]. Construct and interpret graphical displays of data to describe the relationships of kinetic energy to the mass of an object and the speed of an object.